Provide comfort for the family of Florence Ralph with a meaningful gesture of sympathy. Florence M. Ralph, 88, of Warren, peacefully passed into heaven in the Courtyard at Quarry Hill following a period of declining health, with her family and loving staff at her side on January 16, 2019. Florence was born on July 17, 1930 in Camden, the daughter of Alfred and Frances (Berry) Rawley. She grew up in St. George and the midcoast area. She attended local schools and obtained her GED while in her 60’s. 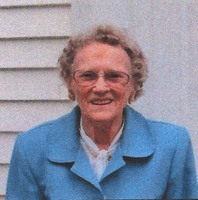 She worked at several local businesses including the Holmes Packing Co., Waldoboro Button Factory, and Van Baalens. She married Richard Ralph in 1961 and they moved to Warren in 1964 where she also managed a hen farm at their home for a few years. Florence was a wonderful homemaker and took great pride in her home and providing for her family. She had a life-long love of the seashore and often revisited St. George and Port Clyde with her family for picnics, and enjoyed gardening, walks in the woods, crafting and reading. Most of all, she took pride and enjoyment from her family as evidenced by the many pictures displayed on the walls of her home and in the family photo albums she assembled which will be cherished for generations. A faithful member of the Warren Baptist Church for many years, she served on many boards and committees, taught Sunday School and Vacation Bible School and was appointed Deaconess Emeritus. She was predeceased by her parents, husband Richard Ralph and daughter Beverly Moody, son-in-law Dexter Hannan, sister Dorothy Means and brothers Raymond Rawley, Ivan Rawley and his wife Sharon, half sister Virginia Coffin and her husband Joe, and half brother Alfred Rawley, Jr. and his wife Ruby, and sister-in-law, Connie Rawley. She is survived by a son, Howard “Andy” Severson, Sr. and wife Debbie of Waldoboro, and daughters Trudy Hannan and Linda Peabody both of Warren; brothers Richard Rawley and David Rawley and wife Marie; sister-in-law Viola Rawley, and brother-in-law Charles Means. She is also survived by her grandchildren, Dwayne Severson, Michael Severson and wife Sarah, Howard “Andy” Severson, Jr. and wife Hilary, Jessica Severson, Shawn Kalloch, Dallas Thang and husband Lenny; Michelle Flaherty and husband Daniel, Jaime Hannan-McMurrin; Kaye (Peabody) Nisbet and husband Ryan; and great grandchildren Lucy Severson; Cody, Michael, Jr., Kyara and Adrianna; Jacoby and Kasen; Trinity and Angelia; Alex, Cara, Kassidy and Kayla; Kaia and Aria; Olivia and Hannah and many nieces and nephews. The family would like to thank the staff at Quarry Hill Terraces and Courtyard for their kind and loving care. There will be no visiting hours. A celebration of Florence’s life will be held on Wednesday January 23, 2019 at 1:00 p.m. at the Warren Baptist Church,with a reception immediately following in the Fellowship Hall. Rev. Dr. Linwood Welch officiating. In lieu of flowers, memorial donations may be made to Warren Baptist Church, PO Box 294, Warren, Maine 04864. Donations are being accepted for: WARREN BAPTIST CHURCH (3325). Provide comfort for the family of Florence M. Ralph by sending flowers. I am very sorry for your loss. My heart goes out to you in this difficult time. I know the pain must be hard right now, but I hope you find comfort in knowing that God cares about how you feel and that He promises that “there is going to be a resurrection.” (Acts 24:15) (1 Peter 5:7) Won’t that be wonderful to see our loved ones again! If you would like to learn more about this hope, feel free to visit jw.org.